Lock in a great price for Four Points by Sheraton Ljubljana Mons – rated 8.6 by recent guests! Very nice hotel on a convienient location. Shout out to the Brazilian waiter who was super nice, welcoming and profesional. He was the highlight of our stay! Other than that hotel is very clean, and breakfast is very good. Clean and comfortable property. Staff was very friendly and eager to help. Very quiet, and nice place to relax. Staff was friendly and made every attempt to meet every thing I asked for. They were actually offended when I jokingly said that they hadn't. Place was beautiful, easy to find and peaceful. The breakfast was great, I had the option to have an omelet. Real American breakfast. Outstanding staff from front desk to servers in the bar and restaurant. Exceptional service. Very comfortable and clean room. Convenient location off the main highway. The staff in the reception are and the bar were very kind and helpful. They even went out of their way to get me a little piece of chocolate for dessert . It was very easy to access by car, located next to a freeway. It had enough parking spaces. The room was spacious and clean. Comfortable beds and we had a window facing trees that was nice. Breakfast was amazingly abundant with a lot of options for us (vegetarians with celiac desease). The location of this hotel was excellent. A cab to the center of downtown was only about €7-8. We really appreciated that they had free parking as many of the other hotels were charging up to 12 to €18 a night for parking! The beds were extremely comfortable and obviously used quality sheets and covers. This was a big deal for me as I usually fine most hotel beds comfortable. The staff was definitely living up to their standards. Going out of their way to accommodate you in every way. They were also very pet friendly, and allowed our cat without any extra fees, they deserve extra points for that. Although the hotel may be a little outdated to be considered a 4-star hotel they do makeup for it with their excellent service, pet friendly, comfortable rooms and their low room rates! Overall I have to say it was definitely a good value and we would definitely stay here again. Four Points by Sheraton Ljubljana Mons This rating is a reflection of how the property compares to the industry standard when it comes to price, facilities and services available. It's based on a self-evaluation by the property. Use this rating to help choose your stay! Enjoying a picturesque hilltop setting and surrounded by nature, Four Points by Sheraton Ljubljana Mons offers a sauna and a gym, a bar, as well as an à la carte restaurant. Its modern-style interior is fitted with high speed WiFi. Free parking is available on site. 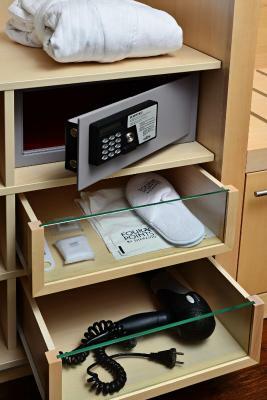 All rooms and suites are bright and offer a working desk, flat-screen cable TV, mini-bar and a laptop size safe. The bathroom includes a bath tub or a shower and free toiletries. Guests can start the day with breakfast in the Restaurant Terazzo serving various healthy options and there can also enjoy live cooking. For evening dining, they can visit the Restaurant Atrium and enjoy forest views. The Atrium offers gourmet dishes and Slovenian wines. They can also relax for a selected house beer from Best BrewsTM Program. The hotel consists of 8 fully equipped and flexible conference halls and 3 smaller meeting rooms. Unique design offers abundance of natural daylight in all public and meeting spaces. The Old Town of Ljubljana is a 10-minute drive away. Four Points by Sheraton Ljubljana Mons is set near the A2 motorway and provides ample parking space as well as the first Tesla Supercharger in Slovenia. Car hire is also available. Postojna Caves can be reached in 22 mi, while Bled Lake is at a distance of 27 mi. The location of the hotel provides easy access to Ljubljana Airport, 16 mi from the property. 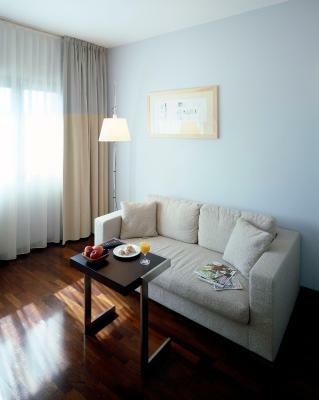 When would you like to stay at Four Points by Sheraton Ljubljana Mons? This double room has a electric kettle, air conditioning and mini-bar. This double room features a electric kettle, bathrobe and mini-bar. This suite features a seating area, bathrobe and cable TV. Comfortable accommodation in the cozy atmosphere of our 114 guest rooms and suites with big free parking space. 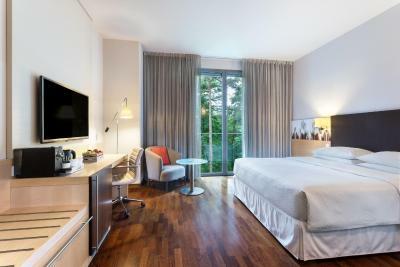 Stay connected via High Speed Internet Access at the work desk, unwind in front of TV with a drink from the mini-bar and sleep well in a Four Points signature bed. House Rules Four Points by Sheraton Ljubljana Mons takes special requests – add in the next step! When booking for more than 15 people, different policies and additional supplements may apply. Four Points by Sheraton Ljubljana Mons accepts these cards and reserves the right to temporarily hold an amount prior to arrival. Green around us, breakfast was excellent. Perfect location near to the highway. Big parking. Room was cold, now way to get it heated and with small kid this is issue for us. Very comfortable stay here. So relaxing after a long road trip. Drive into the centre was easy. The breakfast was fantastic. Great place to stop if you’re travelling this way in Europe. Nothing to complain about it. Services and customer orientated personnel. The dinner was exceptionally tastefull, staff was friendly and spoke several languages fluently. Pillow (my soft spot!) was as good as it can be..
Breakfast is not at the same level as the rest of the hotel. Quiet new structure, very quiet and clean. The first room I got, the heating system was broken, but after contact reception, new room has been provided. Temperature in the room was a bit low to my standard and cannot be set well enough. Noise generator present . No Bellboy employed to carry suitcases for guests. This is a very good stop over night property in Slovenia. Good diner and fast service. Self service breakfast. Parking place just in front of property. Very close to the trans Yugoslavian Highway. Friendly staff. The TV didn't work, no public transportation so only option is taxi or rental car. Lots of conferences and wedding receptions, noisy at night when trying to sleep. Beds are ok, pillows are not comfortable.